This is an overview of how to migrate your Highrise data to Nimble. What can I migrate from Highrise? You may migrate your contacts to Nimble and their associated contact data. What won't I be able to migrate from Highrise? What can I do about this important information? For Notes - You may consolidate notes into the "Description" column on your CSV import, and import notes in a block of text. For Deals - We do not have support for deal imports at this time, and you will need to migrate data manually into Nimble. For Messages - We sync messages automatically to Nimble from your email accounts, therefore, we will fetch the previous 90 days' worth of emails when you first connect your email accounts to Nimble, and we will sync all future correspondence. Highrise CSV exports have two starting columns that are redundant for Nimble, “Kind” and “Name”. Both of these columns should be deleted because Nimble maps contacts by their First Name, Last Name format. Insert a new row for Row 2 in your CSV file so you can make quick edits to each header that needs changing. Other Email 3, Other Email 4, and so forth. Note: these numbers can change, you can have multiple work phones, other phones, etc. But, users must make sure to maintain the correct ordering format. Also note, Nimble does not map Skype as a phone number but instead is headed with “Skype ID 1”, “Skype ID 2”, etc. Note: Nimble does not limit how many URLs you list, but you must list them in sequential order. Because Nimble syncs with your social accounts, you can import these fields as custom fields, so you can title a category with Twitter URLs as “Twitter Personal”, “Twitter Business”, etc, but you do not want to put a “-“ in the title. Nimble does not have a field for instant messenger accounts besides SkypeID, so you can use a custom field titled "Instant Messenger" to include that information in Nimble. Step 8. Issues with cells containing two separate pieces of data. 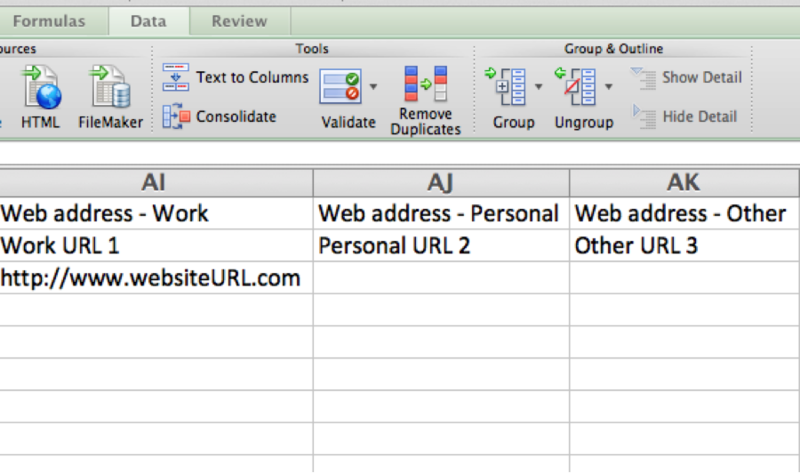 Highrise exports will combine two data fields into one cell, separated by a comma. To resolve this issue, you will have to split the cell by using text to column. (Note: This issue can happen with any multiple of data, most often with phone numbers and address fields. 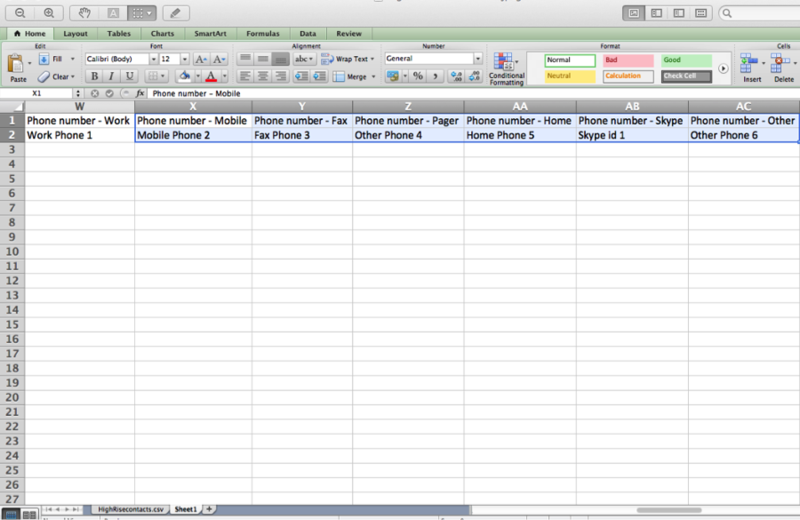 (For example, Other Phone 1 and Other Phone 2 in Nimble would appear under the same header of “Other Phone” as “######,######” – need to have comma value separator in these columns). (Note: this is much easier to work with when you have a phone number cell to separate. 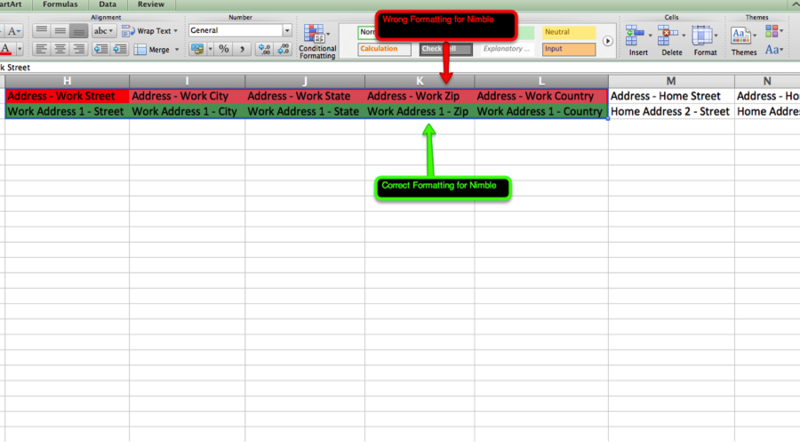 If you have to separate addresses, you will have to manually move the pieces of data to the correct field because there will be more than 1 column separating the address fields. This is because common addresses in Nimble CSV imports share 5 fields near one another). After editing the headers in Row 2, delete the Highrise headers from Row 1 and move your data up by 1 row to line up the data and headers properly. Once you’ve completed these steps, select “Save As…” and select CSV (MS-DOS) format. To upload your new import, go to Settings >> Networks & Imports in Nimble and upload this as Generic CSV format.